Brass gleamed all across the stage, an epidemic of foot tapping spread through the crowd, and waves of appreciative noise frequently erupted after solo sections. In their first official full-length concert, the PUC Jazz Band filled the well-populated auditorium with great tunes and enthusiastic responses. An engaging mix of works, including “Georgia on my Mind,” Duke Ellington’s “Come Sunday,” and a peppy arrangement of “Just a Closer Walk,” kept the concert varied and enlivening. 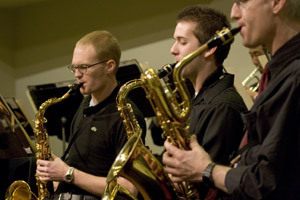 Though informal jazz bands have been meeting and playing at PUC for some time, this is the first year the band is offered as a credit class. At the end of fall quarter, the jazz band played a well-received set after the PUC Wind Ensemble concert. But their March 12 concert was, you might say, their first truly solo flight. A jazz concert is all about having fun—both onstage and in the audience. And there’s no question: the PUC jazz band concert was just plain fun.